Nick Offerman delivers a terrific performance in Hearts Beat Loud, which could be the feel-good movie of the year. It can seem like there's an awful lot of bleakness in the world these days, if that's what one wants to focus on. And that being the case, many movies being released, even ones with ultimately optimistic messages, can focus a lot on doom and gloom. Every once in a while, we just need a movie that makes you feel good. Hearts Beat Loud is that movie. And this isn't just feel good for the sake of feeling good. This music-driven flick is a showcase of talent that centers on incredibly relatable emotion, all wrapped up inside an unapologetic, unabashedly feel-good movie that the world could really use right now. 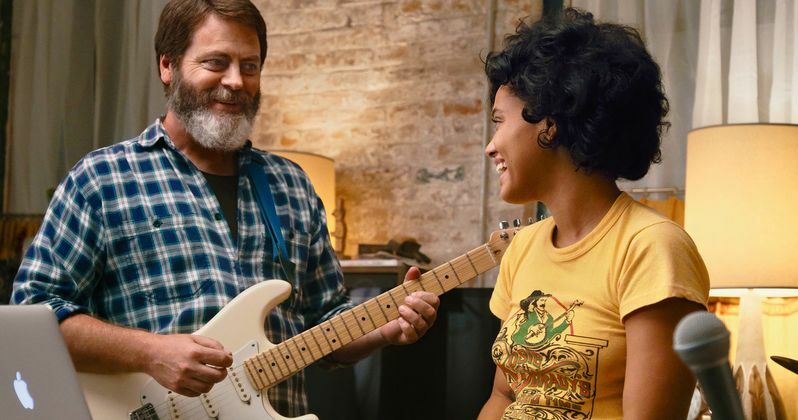 Hearts Beat Loud takes place In Red Hook, Brooklyn, and centers on a father named Frank (Nick Offerman) and daughter, Sam (Kiersey Clemons), who are dealing with some major changes in their lives. Sam is getting ready to move clear across the country for college and Frank is having to accept the fact that his beloved record store will be closing. Amidst all of this, the two become an unlikely songwriting duo after one smile-inducing jam session goes terribly right. Unexpectedly, their music begins to get noticed, which presents the two with some tough decisions as they also learn a lot about one another and themselves via creating these songs together. Movies about music really have the opportunity to resonate with an audience in a particular way. People can connect with music on a very deep level and, when executed correctly, combining music and movies can be something truly special. That's what is accomplished in Hearts Beat Loud. But this doesn't come with the usual melodrama that might be associated with a biopic about a major rock band or a rock star dealing with the usual rock star problems. Sure, there's conflict and an emotional core to this movie, but it's day-to-day, very relatable conflict and emotion, contained within a movie that is simply meant to make you smile. This is for feel-good movies what The Conjuring is for horror. It's relentless in its pleasantries. The duo of Nick Offerman and Kiersey Clemons is what drives this thing home. Keegan DeWitt deserves a lot of credit for crafting the wonderful original music in the movie, but the father/daughter duo is what gives Hearts Beat Loud its emotional resonance and music works a lot better when anchored to genuine human emotion. Many of us know Offerman as the lovable yet rigid, whiskey drinking libertarian Ron Swanson from Parks and Recreation. Here, Offerman plays virtually the polar opposite, but does so with the same charm and charismatic swagger that draws people to him. It's truly one of his finest performances outside of his iconic Parks and Rec character. Clemons, on the other hand, proves why she's an intensely promising young, rising star to keep our eyes on. Director Brett Haley was smart enough, or lucky enough, to be able to surround his two leads with some terrific supporting cast members. Ted Danson, in particular, gets a fun turn here that serves, in a way, as a fun nod to his Cheers days. Toni Collette, Sasha Lane and Blythe Danner are also well-placed and used perfectly. It's a movie that feels like everything just fell into place with. Like a good song, it doesn't feel overly engineered. There's a natural chemistry and harmony to the whole thing that just works. Recalling elements of movies like That Thing You Do and Sing Street, but with a relatable and touching family story at its center, Hearts Beat Loud is remarkably delightful and deserves a large audience. Not because this is some complicated masterwork that runs the risk of being under-appreciated by the masses, but because it's the kind of movie that doesn't get made often enough. There's not an ounce of cynicism in this thing and that's it's greatest asset. This SXSW selection from Park Pictures has a singular goal of making the audience feel warm, fuzzy and happy. It undoubtedly succeeds.